The Baker Dam at Lower Mills causes increased flooding, and the T&H Dam upstream serves no meaningful flood control purpose. Removing these two dams would reduce flooding on the Lower Neponset River. Flooding at Milton Landing, October 2012. Photo: Tom Palmer. The US Army Corps of Engineers and private consultants working for the Riverways Program conducted extensive hydraulic and hydrologic evaluations of the Baker and T&H Dams to evaluate flooding considerations. They concluded that the Baker Dam causes increased flooding and that the T&H Dam serves no meaningful flood control purpose. They also concluded that removing the dams would reduce flooding on the Lower Neponset. The Baker Dam is particularly problematic since floodwaters back-up behind the dam, raising floodwater levels during major storms and causing water to spill over onto the Neponset Greenway bike path, the MBTA tracks and during larger floods, into the Milton Landing area, into the Baker Square Condominium common area near the dam and, under certain conditions, into the Baker Square parking area. Making matters worse, these floodwaters would likely be carrying a load of toxic river-bottom sediments. The Department of Conservation and Recreation completed dam safety engineering inspection reports on the Baker and T&H Dams – the first formal dam safety inspections completed on these dams in more than 25 years. Those inspection reports recommended increasing the flood hazard classification for both dams to “significant” because the failure of one or both of these dams would create additional flooding and might contribute to the loss of life as well as damage to property and infrastructure. The failure potential of the Baker Dam is more problematic because of its close proximity to historic mill buildings in the Lower Mills area and the fact that the dam is an integral part of the foundations of two of the historic buildings. 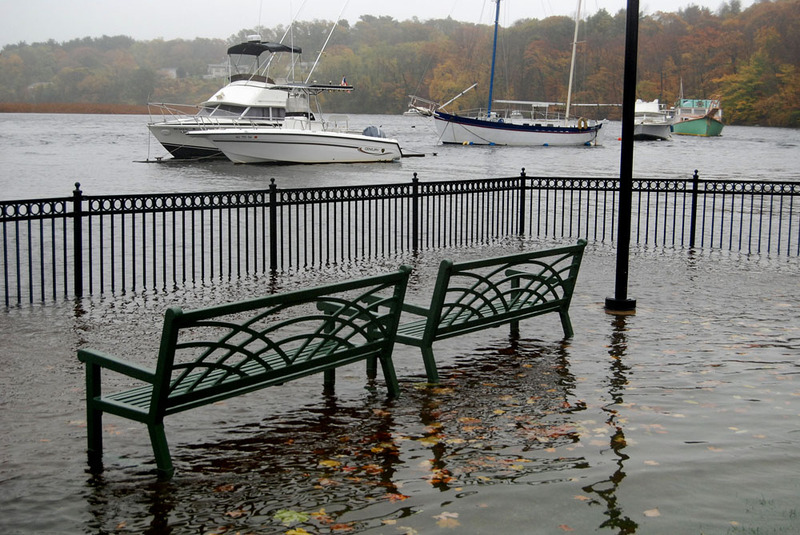 Since construction of the dams was completed in the mid-1960s, there only have been two significant flood events on the Neponset River – one in 1968 and one in 1998. Each of these storms was a relatively modest flood event, at or below the 40-year flood level as estimated by the US Geological Survey, upstream. The Baker Dam flooded the railroad tracks and bike path during both of these events, with 1968 being a major overflow and 1999 a more minor overflow. During 1968, flooding also inundated the Milton Landing area. The recent dam safety inspection reports for the dams indicate that the MA DCR, which owns and operates the dams, has no operations manual for the dams, no operating records, no emergency operating plans, no emergency action plan and no design plans or hydraulic data for either dam. Recently updated bathymetry data show that the flood storage capacity of the T&H Dam is only 60 acre-feet, even using the most optimistic assumptions. Analysis of the hydrograph by consultants Milone and MacBroom Inc. estimates that, at best, the T&H Dam has the capacity to store only 0.15% of the 100-year flood volume and reduce the peak discharge rate by approximately 0.14%. So, if the T&H Dam were completely drained before the commencement of the storm and the gates were raised at just the right moment to shave the peak off the “floodwave,” it would take less than 15 minutes for the pond to refill. For more information, contact Executive Director Ian Cooke at 781-575-0354 x305 or cooke@neponset.org.